Here are a few things I learned when upgrading my Ghost server. I tried first simply installing with the instructions provided on ghosts site. I started troubleshooting, and it went downhill fast, so I restored the server from backup so I could get a clean start. I found that the problem was that I didn't upgrade the node.js version first. 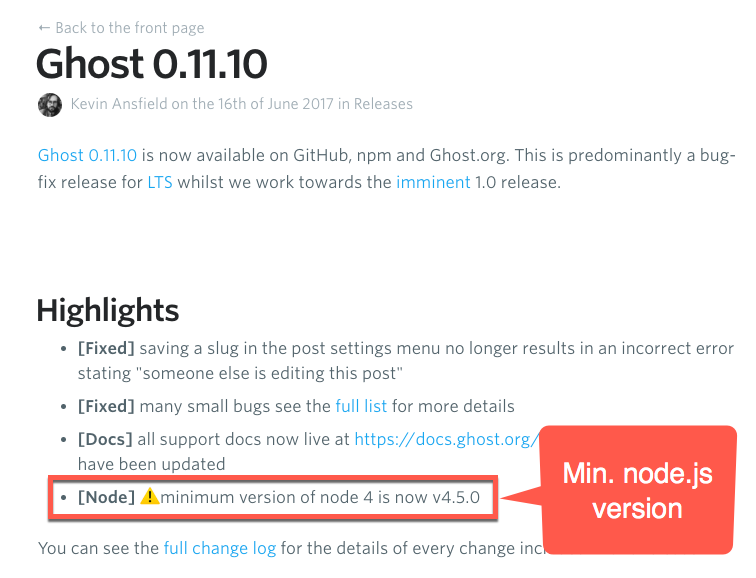 Make sure you have the latest supported node.js version (which is 4.5.0). Check your node version to make sure it's correct. After that, you can follow the instructions provided. Be sure to back up using the procedures they provide. I had a full DigitalOcean backup which proved helpful in this instance. 27 June 2017 - I submitted a suggested edit to the Ghost blog. We'll see if they'll accept it or do their own edit to include checking the node.js version prior to attempting an upgrade.